Brexit’s impact will certainly be studied through theatre. There are myriad opportunities for thoughtful examinations and retellings. Unfortunately Bricks of the Wall is not one of them, lacking the nuance required to meaningfully contribute to the debate. The premise is appealing. I’ll skimp on detail so as not to foreshadow the plot twists in this 75-minute piece, but suffice to say that the night opens with what the programme tells us is a ‘fabulous dinner party in London’ and ends in extraordinary violence. So far, so interesting, then, and certainly amidst the Brexit chaos it felt apt to see what might unfold in this theatrical thought experiment. But it’s immediately apparent that the acting from this energetic cast can’t match up to the plot’s soaring aspirations. The writing, too, lacks subtlety – especially disappointing, given the political subject matter is so subtle and complex. Our writer and lead, Sophie Pâris, especially frustrates as Isabelle. The flaws of this character are symptomatic of wider character development issues. She fluctuates between being sympathetic, pleading for calm when tensions run high, and insufferable – gurning, weeping and wailing. 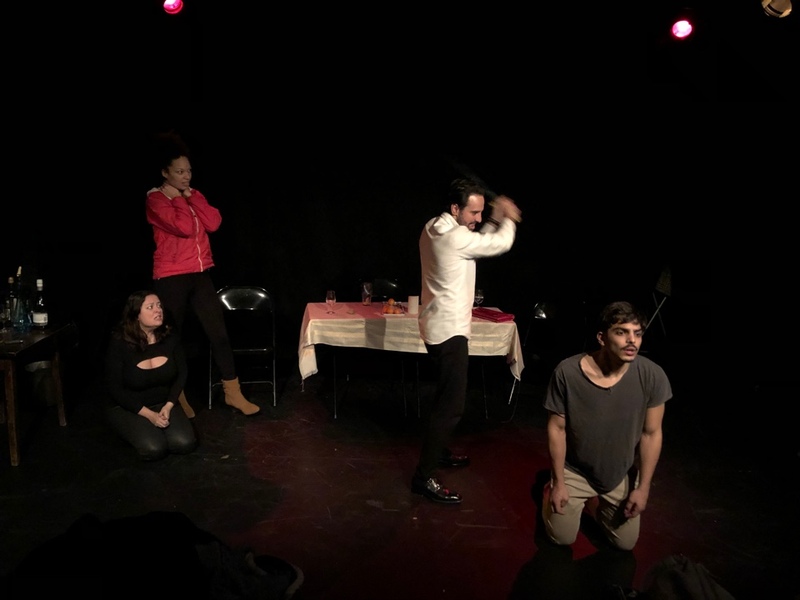 The relationship between Isabelle and her husband Neb (Julien Romano) seems equally as muddled and acting is over-seasoned in all cases, with only Romano showing real light and dark. Even this is undermined by an unconvincingly rapid descent into barbarism that sees him floridly maniacal. The staging also offers no port in a storm here. The set is necessarily basic, and that’s more than acceptable – but lazy shortcuts become distracting. It’s asking a lot of audiences to imagine they’re watching a chic dinner party when shown ‘homemade’ pre-meal nibbles in the form of unpeeled satsumas and whole bunches of grapes. If pre-dinner fruit is a thing, I’m (mercifully) yet to experience it. Silly details niggle; characters bemoan their acute hunger after a day under martial law while a large tray of Ferrero Rocher sits on full view stage left throughout. Let’s be clear: audiences go into these small theatres (the Etcetera Theatre is above a busy Camden pub) under no illusions. It’s understood that space and budget constraints mean disbelief must be suspended. But help should be given to support these enthusiastic audiences in this and the intimacy of the room, where actors operate almost in their audience’s laps, should be respected. The closing scenes here fail to pay due deference to audience proximity and the neglect of choreography is a mistake. The movement here feels, well, chaotic, and not in an intentional way. Actors stalk the stage clumsily or untidily, confusing the audience and eroding any steer about who should be holding our attention. Crescendos of sustained, overlapping shouting leave us stumped about what’s being communicated. We understand that we’re seeing a depiction of political and moral panic, but there are ways to represent this that avoid confronting your viewers with a maelstrom of sound and action without apparent direction. In a week of momentous political turmoil, a night of theatre scrutinising how we got here and what happens next should offer the perfect tonic. Sadly this production only adds to the chaos.